With its towering skyscrapers, the skyline of Frankfurt am Main is like no other in all of Germany. The OMNITURM site address is in the Grosse Gallusstrasse. The building twill top height at about 190 metres and sited diagonally opposite the Commerzbank Tower, the highest building in Germany (259 metres), it will be the sixth tallest building in the city. And the list of superlatives goes on: When the build is completed, and that is scheduled for early 2019, Frankfurt will have the only city intersection anywhere in Europe with a highrise tower (≥ 100 m in height) on each of the four corners. What's more, the OMNITURM will be Germany's first truly mixed-use highrise, offering office, residential and public-use spaces. Visually too, it will be outstanding in the truest sense of the word. The draft from internationally famous architects Bjarke Ingels (BIG) envisages a spiralling, sequential offset of the floor plates on floors 15 through 22. 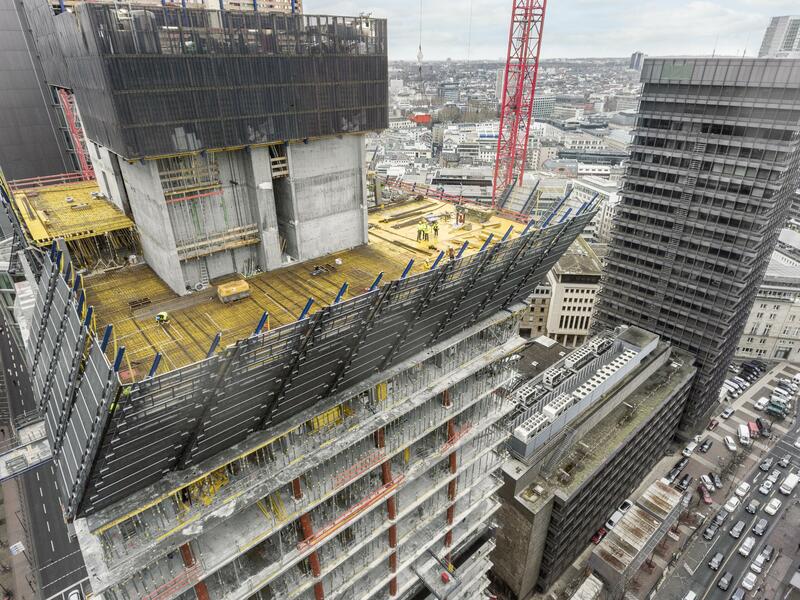 That constitutes an unusual challenge for lead contractor Adolf Lupp GmbH & Co. KG and their formwork engineers from Doka. The OMNITURM's shift of the hips marks a change in building use. 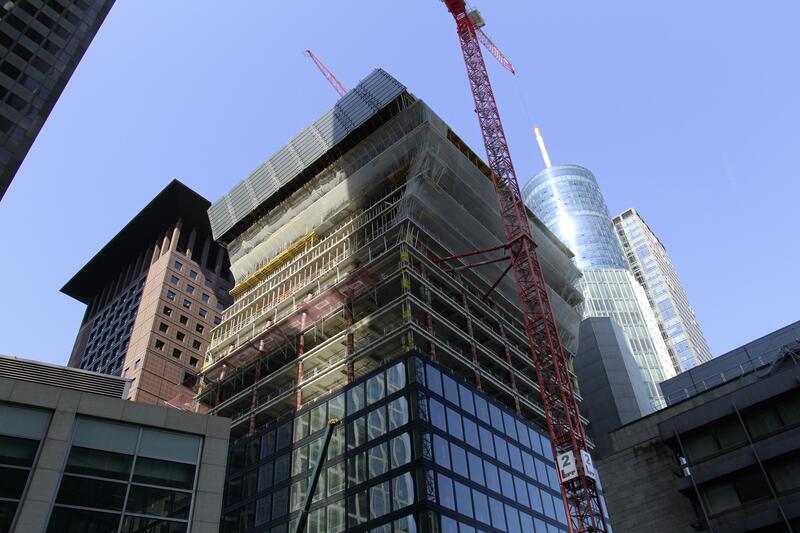 From street level up to level 15 it will accommodate public spaces and offices, and again from level 23 upward the building will house offices. The section in between is residential. This band will offer some 8,200 m2 of residential floor space, with terraces and overhangs, offset from floor to floor, on all four sides of the building. This sideways-shifted section also demanded the utmost in engineering for formwork planning and for work on site. 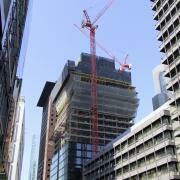 The safety requirements on this site slap in the middle of the bustling inner city are ultra-high. Day in, day out, pedestrians and drivers stream past the site in their thousands and need protection from falling objects. So too does the site crew, and of course they have to be protected against falls and also against adverse weather conditions. 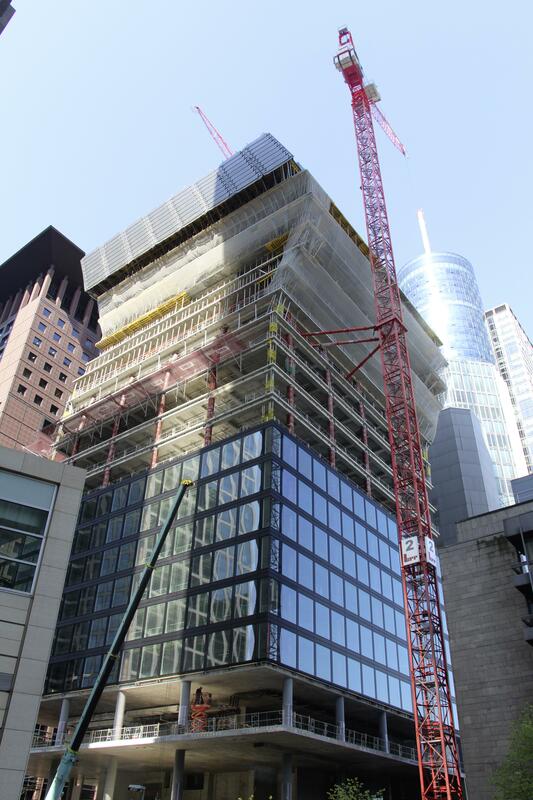 Normally, this would require a vertical protection screen that would climb along with the building. 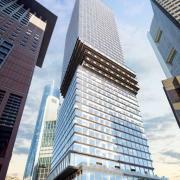 On this build, however, that shift of the hips characterising the residential part of this tower precluded that option. So the engineers from Doka put on their thinking caps and came up with something new: a protection screen with hydraulic rams for climbing vertically, but also with the ability to tilt forward, backward and even to the side to climb those offset levels. And no modifications are required. 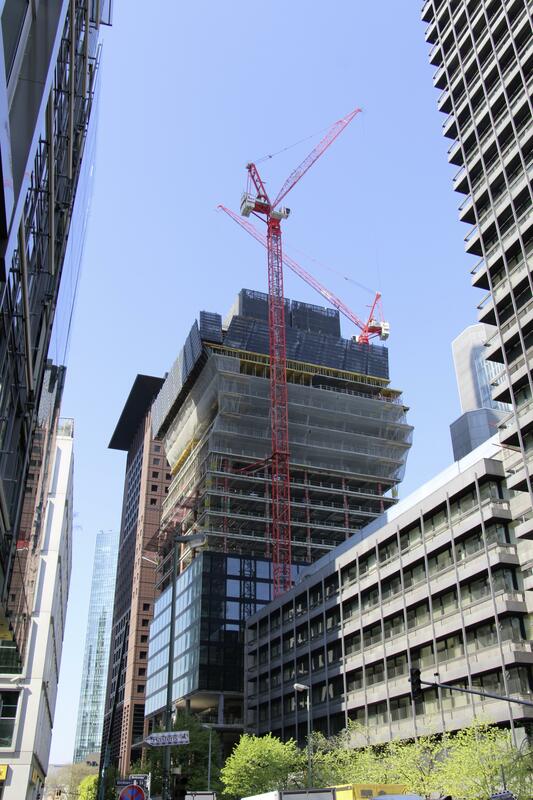 From level to level at the spiralling offset, the building steps up to 1.35 m round the perpendicular. So depending on the direction, the protection screen tilts up to 21 ° in all directions. "The distinctive feature of this screen is that there are slats so that parallel shifts to both sides can be made and there is huge variability in height. On our project that is a big help – a very big help in fact", says Michael Bellon, head foreman with construction company Lupp. At the level of maximum offset, the residential section is more than 5 metres off the baseline. The slab edges on these residential floors will also serve as balconies and as projecting roofs, so they are only 15 cm in thickness. To carry the high live loads for concreting and the weight of the protection screen, extremely strong shoring was used. In fact, taking the weight under the corners of the residential-section floors are girderframe units and load-bearing systems otherwise found only on bridge-building projects. In March,the protection screen reached the absolute extreme angle of lean. From that level upward the floors gradually return to the baseline, and the rest of the tower is again rectilinear. The internals of the OMNITURM are two highrise cores (for elevators and stairways), which are climbing skyward from two independent platforms. Platform system SCP including hydraulics is in use in both cases. In this construction method, the core is formed and cast ahead of the subsequent storey floors. Producing walls and floors separately allows for a simpler construction workflow with focus on the individual component. The site equipment, complete with the reinforcement, is more or less stored on the platform. Powerful hydraulic cylinders cranelessly raise the platform, formwork and equipment containers to the next pouring section, in only one lift. 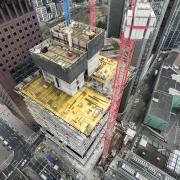 The procedure saves time and also space, an important factor on this build where conditions are very cramped both on the ground and as the tower rises. 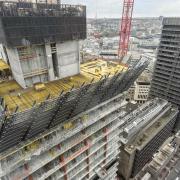 Space is an issue not just on the topmost construction level but also one level down, where formworking is in progress. The platform maximises opening travel for suspension of the panels – yet another benefit along with the convenience of the all-round enclosure. It protects the workers from adverse weather conditions and dangers, especially on the topmost level. 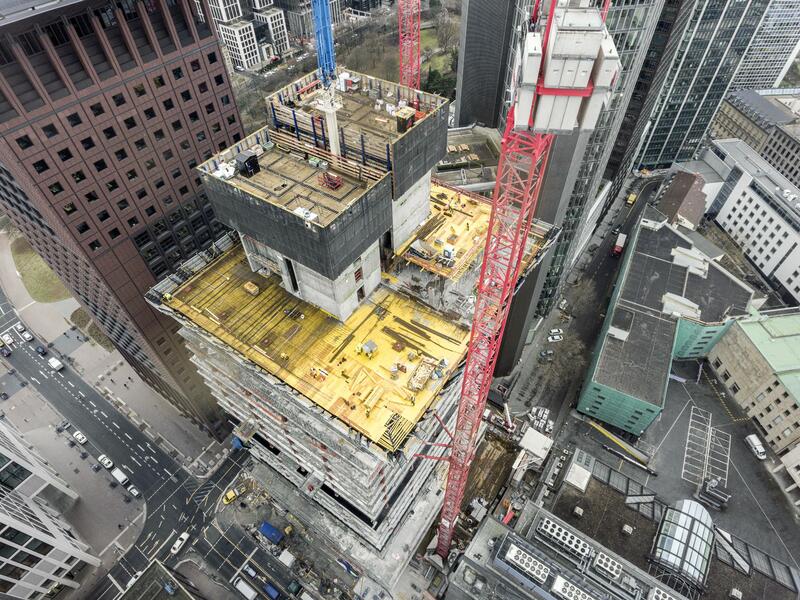 Right now the highrise cores are growing upward past the neighbouring towers, and no time is being lost as the floor slabs of the residential and office levels follow. On the lower floors the façade work has started, so close to street level the OMNITURM is already taking on its final shape. 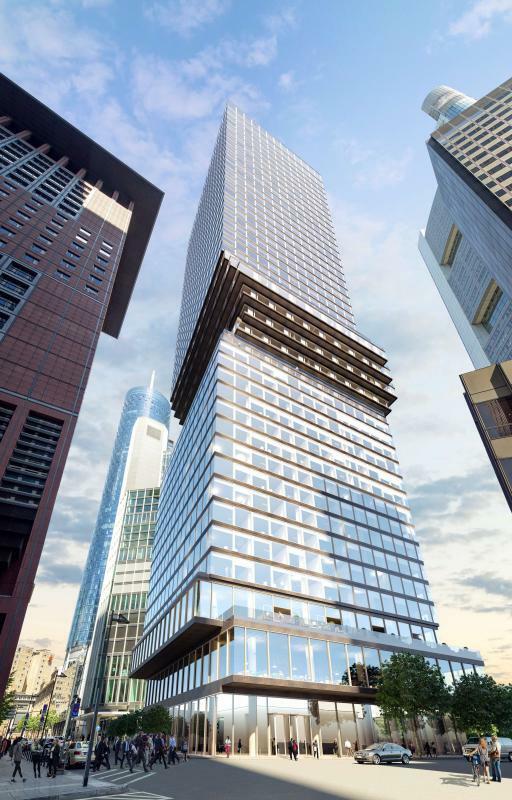 The OMNITURM is the latest prestige property from Tishman Speyer. The developer is no stranger to Frankfurt; the Messeturm, the Opernturm and the Taunusturm towers all belong to the Group's property portfolio. 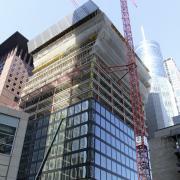 According to figures released by Tishman Speyer, the building will offer more than 43,850 m2 of rentable class A office space, some 8,175 m2 of contemporary residential space and more than 1,579 m2 of publicly accessible areas. Other amenities will include inviting common spaces, bicycle parking, electric vehicle charging stations and gastronomy and catering. There will also be direct access to a newly developed park and plaza adjoining the building. 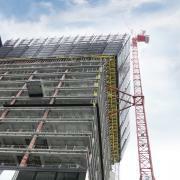 Once completed, the tower will offer flexible and efficient space with state-of-the-art functional design features. 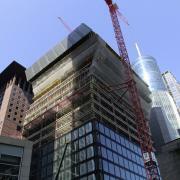 Tishman Speyer is targeting LEED Platinum certification for the tower upon completion. Thank you for your interest - Wonderfully shifty. Thank you very much for your interest - Wonderfully shifty.